Seasoned flats fishing (backwater fishing or sight fishing) anglers know how to read the flats and respond to different variables as they experience them, but to a new angler the flats can be complex waters. The truth is, for an experienced angler, the flats are a mixture of elements and patterns that often require quick thinking and adaptability to find success. With many different kinds of shallows that can be fished in many different ways depending on the conditions while you’re out on your flats or shallow-water fishing boat, it’s important to have a basic understanding of the waters you could be facing so you can find success when you go out. Flats are a seemingly endless expanse of featureless water that beginner flats anglers may turn a suspicious eye to with doubt that any fish actually call the area home. But don’t worry, there are fish there. You just have to know what to look for, or how to read a flat. Casting platforms are a great tool, since they elevate you to a higher vantage point. Look for signs of movement, such as tails or fins breaking the surface, rolls, wakes or flashes. Notice subtle hints that can give away the location of fish. With these two points in mind, here’s how you can become a pro flats angler and get those strikes in the shallows. First thing’s first: don’t even pick up a rod until you’ve scouted the area for fish. If you’re immediately putting your rod in the water and just hoping for the strike, you likely aren’t going to get one. Before you even bait your rod, you should visually scout the waters to look for signs of life. Then, once the fish have made their presence known to you, it’s time to fish. Contrast: A contrast is an area of the water that looks different than the rest of the shallows. These can include a deeper or shallower area, a thicker patch of grass, a barren patch, clearer water or muddier water. These areas are often feeding stations, so once you find them you’ll have better odds of landing a fish and know right where to go whenever you come back. Anything That Breaks Up the Normal Water Pattern: If you can see wakes, pushes, humps or nervous water, start looking for signs of fish. Look both near and far as fish can be underneath you or several hundred yards out when your visibility is good. Don’t pass up any opportunities and you’ll be landing a fish in no time. Edges, Channels, and Contours: Some seasoned flats anglers swear by starting on the outside edge and working their way to the top. They’ll then move towards the back edge to get strikes from fish returning to deeper waters as the tide starts to drop. When you come across a channel, pay close attention for shadows or anything that seems unusual in the water, as these signs may tip off fish moving between water depths. Then, take notice of any contours to find structures and other areas that may be feeding grounds for the fish you’re looking to catch. Tide, Wind, and Other Conditions: Subtle structures in the shallows are going to constantly shift depending on the conditions. If you’re looking to be a pro flats angler, then you’ll also need to learn how to react to different variables while you’re fishing the flats. 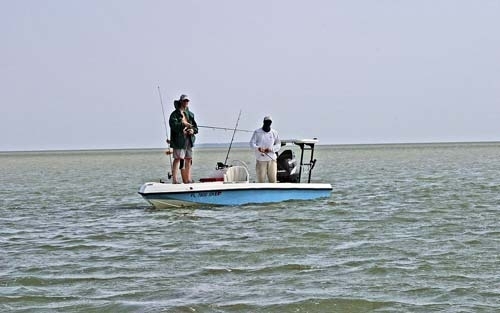 Variables are going to change depending on where you’re fishing the flats, whether you’re in saltwater inlets, marshes or mangroves, grass beds, channels, flats or potholes, so having an understanding of how to fish given different variables is going to take your flats fishing game to the next level. Barometric pressure and air temperature are going to dictate which fish you are going to find out in the flats. It’s key to note that high air pressure will keep water levels low, while lower pressure will result in higher water levels. Rapidly changing pressures will also trigger or deter feeding for some species of fish. In regards to air temperature, keep in mind that water temperatures will take a longer time to change so days of sunshine or a chilly night won’t affect the waters as much as you may think. This will influence whether you’ll be fishing for warm or cold water fish. If you’re in deeper waters, you’ll want to head out on a sunnier day to help you see deeper and read the flats. 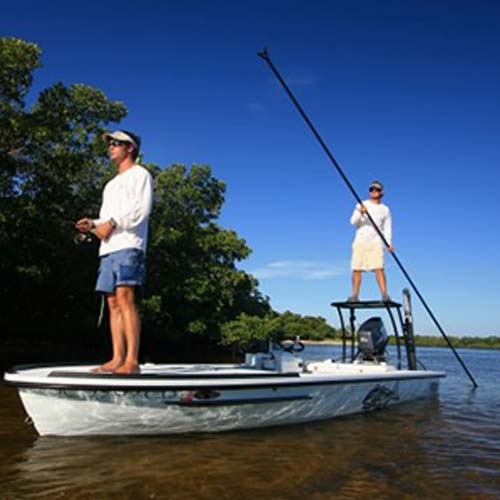 These conditions are perfect for the angler seeking strikes from fish like Tarpon. On the other hand, cloudy days are going to be excellent for low-light loving fish like Seat Trout, Snook, and Redfish. Most seasoned anglers have a good grasp of how the tides can drastically change how their fishing goes throughout the day; it’s no different for flats fishing. Consult a tidal chart for the specific location you intend to fish so you know how many tides to expect, and when. You also want to pay attention to how the tides change depending on the season. For example, spring tides may result in faster currents and more water movement, which could create agitation. 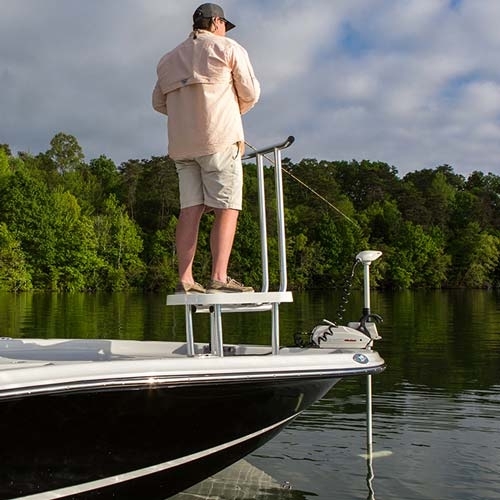 When you’re fishing the flats, you’ll want to make sure your boat is equipped with a low draft capable of shallow water navigation and a casting platform to help you get even better sight out over the waters. You can add a t-top to your flats or shallow fishing boat for shelter and an unobstructed deck, just make sure you choose one that folds so it doesn’t interfere with your casting, like the Pro Series T-Top. This universal t-top won’t restrict you just to the flats either; you can also use it when you go offshore to explore other saltwater fishing avenues. Once you have your gear and know how to read the flats, you’re ready to start getting strikes. Just remember, as with all sports, skill comes with time and practice. When you’re first starting out, reading the flats may seem impossible as a beginner’s sight tends to see a flat expanse of endless nothing, but as you become a seasoned flats angler, you’ll start to notice the subtleties that lead you to where you need to cast your line.